Three decades . . . Five Riftwars . . . One magnificent saga: From New York Times bestselling author Raymond E. Feist comes Magician's End, the final book in the epic Riftwar Cycle. Thirty years ago, Feist's first novel, Magician, introduced us to an orphan boy named Pug, who rises from slavery to become a Master Magician, and to Midkemia and the Riftwar, an epic series of battles between Good and Evil that have scarred Pug's world for generations. 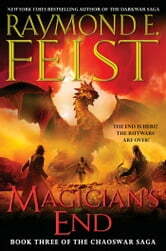 After twenty-nine books, Feist delivers the crowning achievement of his renowned bestselling career: Magician's End, the final chapter in The Chaos Wars, the climax of his extraordinary Riftwar Cycle. Pug, now the greatest magician of all time, must risk everything he has fought for and everything he cherishes in the hope of destroying an evil enemy once and for all. But to achieve peace and save untold millions of lives, he will have to pay the ultimate price. I've been reading Feist for about 30 years now and love his style of writing. I thought this was a fitting end to the series. Always epic battles with other races and with the characters fighting internally themselves. I thought up many ways to end this series myself and actually 5 of the 6 were the in the book. How he tied them all together just fascinates me. If you have read all his books you know what you're in for and Feist doesn't dissapoint. I don't want to include any spoilers so I'll just say this. It's a perfect end to a 30 year run, and it finishes perfectly. Thanks Raymond Feist. Well what are you waiting for buy it and get reading. After all these years of following this series I have to say it was a satisfying conclusion to a fantastic epic. Wow, a great story! I can't believe I've been reading the Riftwars series since the eighties. Every book was so well written, they always allowed me to see the story in my mind' s eye. Always felt like his books displayed an almost non-fiction side when it involved the politics of the kingdoms and an incredible world of fantasy when reading about Pug's storyline. I heartily recommend the entire series of the world of Midkemia! A fitting ending to the series. Some twists and turns as you would expect, if you have read the entire series, but the story is still entertaining and fulfilling. Worth the read if you are a fan of 'magic and majesty'.